Upon his much-awaited arrival in Darjeeling this evening, yoga guru Baba Ramdev ( See photos here: Baba Ramdev in Darjeeling ) skirted questions on the demand for a Gorkhaland state saying it was a political issue. In the same breath however, he said he respected the sentiments of the people. On his maiden visit to the Darjeeling hills to conduct a three-day yoga camp from April 17 to 19 being hosted by the Gorkhaland Territorial Administration, Ramdev received a humongous welcome as he arrived in a motorcade from Bagdogra airport. When asked about the actual purpose behind Ramdev’s visit, Gurung said it was his long cherished dream to bring the yoga master to the hills for a camp. 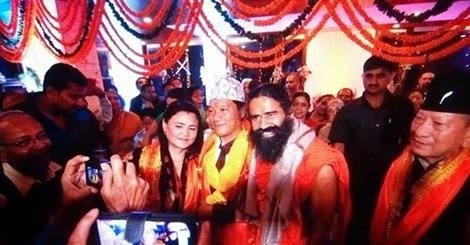 “Please, let me make it clear that Baba Ramdev is here to conduct a yoga camp and his visit has nothing to do with politics,” said Gurung. northeast region are a treasure of trove of several medicinal and herbal plants. You will get a unit of the Patanjali Yogapeeth very soon,” said Ramdev. Gurung said the GTA would identify the land for the Patanjali Yogapeeth unit. Upon his much-awaited arrival in Darjeeling this evening, yoga guru Baba Ramdev skirted questions on the demand for a Gorkhaland state saying it was a political issue. In the same breath however, he said he respected the sentiments of the people.